Upstairs in the Visitor Centre there is a hireable room about the size of a normal classroom with desks, chairs and a sink. 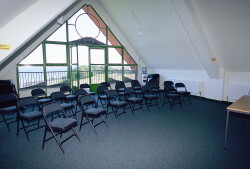 This has a fantastic view and is a perfect venue for events, meetings and training. A flip chart, wall mounted TV with PC connection points, and a projector screen are available on request. Normally groups are not permitted to eat or drink within the centre and for fire regulations, numbers are limited to a maximum of 50. However if the group agree to vacuum and clean up after usage then this will usually be permitted, subject to normal charges applying. An application form for hire of the Education Centre can be downloaded below but you are advised to contact our Visitor Centre to check availability prior to booking. Please note: Normal parking charges apply.